Piglet from Piglet in France has very kindly presented me with the Versatile Blogger Award. Piglet revealed in her 8 interesting snippets about herself that she was the UK Junior ice-dance champion when she was 16 (2 years running). You never know what you'll find out with these awards! What her readers do know though is that her blog is a great read and well-deserving of her award. So now I have to reveal 8 things about myself. Interesting things, preferably, I suppose. I'm not sure if I've mentioned some of these things before, so do forgive me if I repeat myself. 1. I used to do a lot of music in my youth - singing and playing the viola. I've played/sung in such illustrious places as the Royal Albert Hall, and The Maltings, Snape. 2. I was in the school choir chosen to sing on one of the BBC Schools music radio programmes. 4. 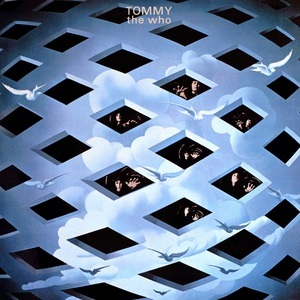 When I was 15 I was in the west end production of The Who's musical 'Tommy' at the Queen's Theatre. At that age, I was only allowed to stay for 7 weeks. After that I never gave a second thought to the idea of acting. Doing the same thing night after night was very boring. 5. I rather dislike receiving mail (snail). There have been difficult periods in my life when I would get stressful stuff in the post and it's marred me for life! 6. One of the big joys for me of publishing my little Slim the Ogre book was that I can now be consider a 'something' - I'm a writer. Before I just had my job, no career and no 'something' to my name. 7. Part of why I could never say "I'm a 'something'" was because I did what turned out to be a useless degree (practically) - Arabic and Islamic Studies. Now it's very useful, but in the mid-80s it led nowhere except translation and I hate translating. 8. I absolutely love total peace and quiet. I'm surrounded by humming machines all day at work and noisy boys/television at home, so when I get the chance I just savour the silence. So there you go, now I've got to nominate someone else. No obligation, natch. After a quick run down my blog list, I'd like to nominate Amber in Travelling Amber. Amber is expecting her first child in December and has been writing about what it's like to be pregnant in France. She's also got the Neighbours from Hell to deal with plus the added complication of having island in-laws who speak creole. Amber's blog is a good read and deals with many day to day life in France topics with intelligence and insight.